When we hear about global issues addressed by world leaders over the years, the ever increasing pollution levels, environmental and sustainability concerns are often among the main topics of discussion. By 1997 it appeared that mayor advances were on the way with the signing of the Kyoto protocol and growing investments in renewable energy during the decade that followed. Although some figures show that many countries met their pollution reduction targets for 2012 that were set, the main goal of “cutting global emissions of greenhouse gases” is far from reality. In practice, rapid development and industralisation of emerging economies (particularly China) and growing consumption trends worldwide have maximised global pollution levels to a dangerous “overshoot point”. According to Global Footprint Network, today we humans would require 1.5 planets to cover the resources we use and waste we generate. It’s not surprising to see how many cities across the globe have put special efforts in tackling their pollution, traffic and congestion issues – trying to develop a more efficient and sustainable transport system at a local level. Starting from Amsterdam as the clearest example, many European cities have become increasingly bike-friendly over the years (including public bike-sharing schemes in many cases). The initially controversial congestion charge that started in London back in 2003 proved to benefit people from less pollution and greater air quality. In addition, many other cities have gone through significant improvements in their public transport services over the years. Overall, I would say that European cities have improved their urban mobility systems, benefiting their citizens and visitors. In other places the emphasis has focused more on the empty seats in cars. It’s actually quite frustrating to be in a morning traffic jam on the way to work and then realizing that the great majority of cars stuck there are only transporting one passenger (the driver). Therefore many governments, companies and institutions are educating their people to carpool, emphasizing on fuel savings, a more efficient transportation and the environmental benefits involved. Some cities have even set restrictions, allowing cars to circulate only with a minimum of 3 passengers at certain rush hours. Since the 1970s, total distances covered by high-occupancy vehicle (HOV) lanes have been gradually increasing in US motorways – as carpooling practices have been promoted by different states at the same time. HOV lanes are also frequently seen in Canada, Australia and some big cities in Asia like Jakarta. Nowadays that we live in the digital era and being constantly connected, it’s sensible to make good use of these mobile technologies so we end up developing a more reliable, efficient and sustainable mobility system, whether it’s just within a city or for longer journeys. The use of global platforms such as Carpooling.com and Blablacar has grown exponentially over the last few years. At local/ country-specific levels there are also other options, for example in Spain I’m aware of Amovens (probably the first Spanish based ridesharing platform) and SocialCar (for a different concept, known as P2P carsharing). The way ridesharing platforms work is simple. If you are a driver going from one place to another and you have empty seats, you can publish the date and time of your journey, the cost of the ride along with your personal details. If you’re looking for space in a car for your journey, login and find a suitable ride that fits in with your schedule. Historical reviews and ratings among former drivers and travellers are key in order to establish trust within the community, but a complete public profile and verified personal information in the platform also help. “Ridesharing practices started increasing in Spain quite late (around 2009) and it was mainly caused by the economic crisis, but nowadays it has already become a social phenomenon as people are becoming increasingly active. They enjoy it and they’re realising the benefits involved” – says Diego Ochoa, marketing manager at Amovens. As well as offering the P2P service open to everyone, Amovens can also provide specific carpooling networks for institutions or event organisers. A considerable range of different companies, governments, universities and festivals are among their clients. “The shared car is an alternative with economic benefits, but also has environmental and social advantages. The community aspect is very important. We look to motivate people to carpool not only on the occasional weekend, but also regularly when commuting to work or to university. It’s great because companies can serve their Corporate Social Responsibility (CSR) and encourage closer bonds among their employees at the same time” – highlights Diego. Some people perhaps consider that these platforms are exclusively for hippies or adventurous travellers, but the fact is that they’ve become increasingly popular in Europe over the last few years. In Spain particularly it would be very rare to find a local hitch-hiker (whereas in other parts of Europe it’s more common), but platforms such as these are becoming almost mainstream, making strangers trust each other and providing another travel option to plenty of young (and not so young) Spaniards. In fact, a recent survey suggests Blablacar is one of the most widely known collaborative economy platforms in the country – much ahead of Airbnb. In march of this year, these trends resulted in a formal complaint by Spanish bus companies for what they consider “unfair competition” of online platforms. These defend themselves saying that their activity is completely legal, as the driver is simply sharing fuel and transport costs among passengers without making a profit and they even adopt mechanisms to control lucrative behaviours. Odile Beniflah, Global Marketing Manager at Carpooling.com, wasn’t surprised but sees it from a different angle “It’s an understandable reaction by the bus companies, we also had this tension in Germany many years ago when the train companies saw us as a competitor. We approached them saying that people who come to us just want to go from point A to B, but often find the train inconvenient. We suggested integrating the train option in our website so that the users have all options, they agreed and within 3 months we were already among the top 5 resellers of train tickets. It’s a win-win for everyone”. In terms of their experience, Carpooling.com started in 2001 just as a basic solution by a group of German students to be able to visit their girlfriends on weekends. The founders went on with their careers elsewhere but the site remained live, just lying there. Surprisingly the activity went increasing over the years, and then the founders decided to run carpooling.com on a full time basis. Odile clearly finds that “The most difficult thing is to get people to try it the first time. Once people try it they come back to it, and we have 99% user retention rate. It’s just a matter to have people trying it. We even have a women-only option, but most of them don’t necessarily stick to this option in their following trips. Our surveys also suggest that carpooling was not so convenient before, but now it’s a very simple solution for drivers and passengers”. Mobile technologies and social media are playing a key role in the massive adoption of carpooling practices. All platforms are taking advantage of them in a smart way to strengthen trust within their community, which is probably the most crucial aspect of all. 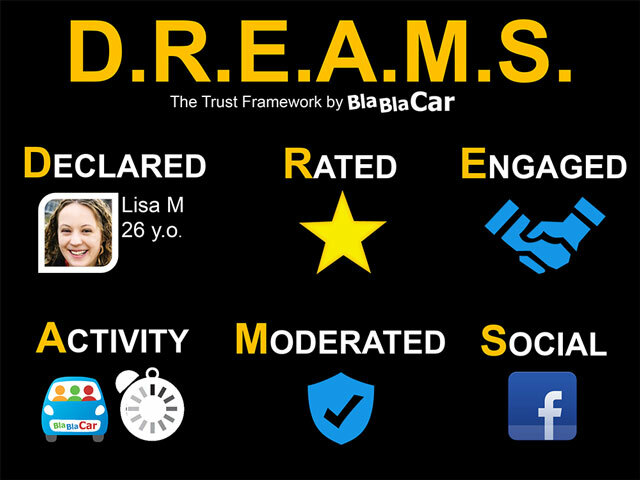 Blablacar defines it as the DREAMS framework, suggesting that completed and active user profiles have 6 main components seen as “pillars of trust in a peer-to-peer network” (declared – rated – engaged – activity – moderated – social). It was amazing to find that the DREAMS survey conducted to a sample of Blablacar users resulted in an average trust score of 4.2 out of 5 for complete DREAMS online profiles, only below actual friends and family members (4.7) and significantly above strangers (2.2), Facebook friends (3.5), neighbors (3.6) and even colleagues (3.8). This study basically proves collaborative economy platforms can effectively “create trust” remotely with the tools that are already available nowadays. With additional security measures the degree of trust goes even further in the concept of “P2P carsharing”, which involves directly handing over the keys to other people so they rent your own car while you don’t need it. 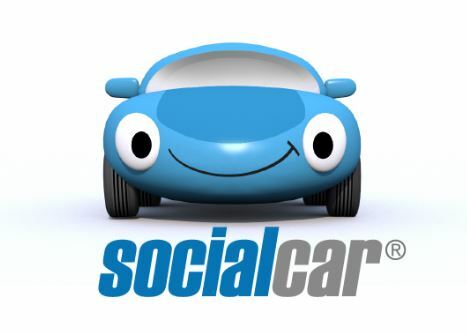 SocialCar is the first Spanish startup that offers this service and just it was also set up as a solution. “After living elsewhere, the members of our founding team returned to Spain and followed the flow – they bought a flat, a car, etc. But they soon realised that owning a car didn’t make much sense because it was hardly ever being used, so they looked for alternative platforms to rent out their car safely from time to time. They noticed that P2P carsharing didn’t yet exist in Spain and SocialCar was founded in 2011.” – says Alexandra Ramió, marketing and communication manager. She also remarks changing behaviours as people acknowledge the many benefits involved “Some of our users even sold their car initially given on rent, and decided to hire cars occasionally through our platform instead. They benefit from advantages like the absence of fixed costs, gaining flexibility and access to different vehicles according to each occasion and needs. Some even say that now that they don’t own a car, they can enjoy the experience of driving more expensive ones and save a lot of money at the same time. On the other side, our car owners remain satisfied by getting extra income when renting their cars while they don’t use it”. Alexandra also questions whether it’s always suitable to own a car in cities like Barcelona. “There’s neighbourhoods where it’s just impossible to fit a car, often there are very few parking spaces”. The platform sometimes also plays a part in terms of community and social aspects – “There are cars offered across all over the city and people can easily access them nearby. They are often hired in the same neighbourhood or block, and sometimes neighbours even start talking to each other through SocialCar”. In terms of environmental contributions of this phenomenon, Alexandra points out that “Because of this service people tend to rationalise the use of private cars. They tend use it less often and what once was 5 cars for 5 people now can perhaps become 1 car shared among 5 people – reducing the number of cars using up public spaces in the city”. Although it’s understandable that these upcoming trends may cause some concern due to their “disruptive” nature, I think the benefits clearly outweigh the uncertainties. Surely these alternative tools can be developed further to help achieving more efficient and sustainable mobility, and they should be seen as a major opportunity rather than a threat. Furthermore, what only started last year as the “sharing citties network” goes way beyond onto all sorts of shared resources within cities – including spaces, knowledge, skills and housing among others. The kind of platforms discussed earlier would just be a fraction of this broad concept, which is already being promoted in almost 50 cities across the globe (often with an essential support of local governments) to face the many social, environmental and sustainability challenges that lie ahead. Back in 2011, planetary futurist Alex Steffen already discussed some of these ideas along with many green innovations in a fascinating TED talk which you can see below.